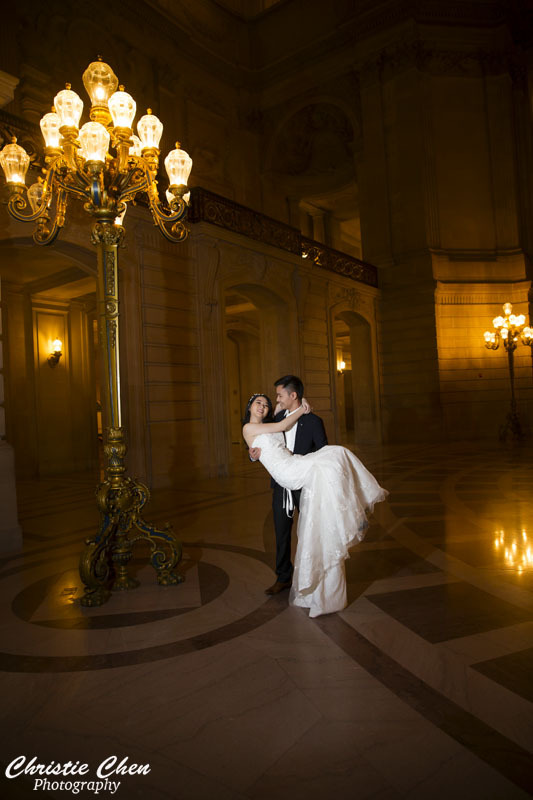 There are three ways to get married at San Francisco City Hall. this is the option which majority of people choose. You will have to schedule an appointment to obtain your marriage license, pay an administrative fee $105, and set up a second appointment for the actual civil ceremony, with additional cost at $81. The ceremony will be conducted by a city hall wedding commissioner, and the whole ceremony takes about less than 10 minutes. 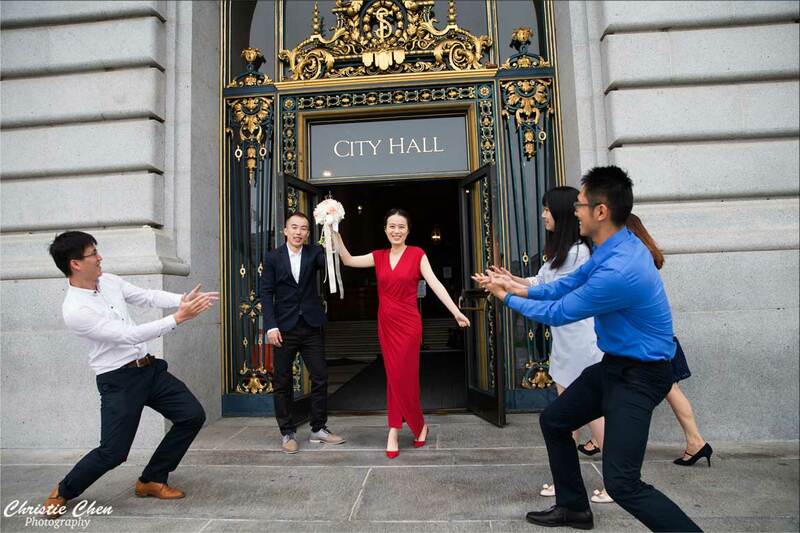 You may only book your civil ceremony appointment no earlier than 90 days in advance, and a 6-guest limit is officially imposed at least according to the City Hall rules. Although officially you can only bring at most 6 guests, we did see lots of wedding parties who have more than 6 guests. You can make reservations in person Monday through Friday from 10:00 am to 3:30 pm. 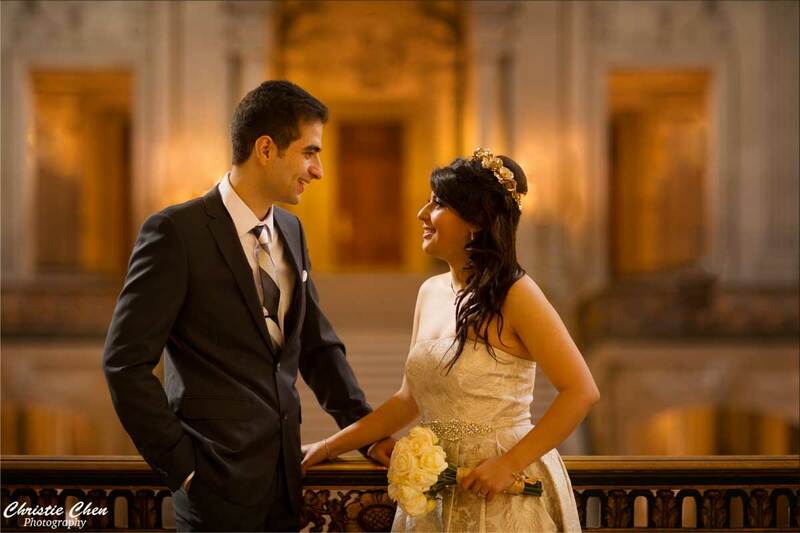 City Hall makes reservations for three weddings at a time, each marriage ceremony time slot is for thirty minutes. You will pay for your reservation at the time that you reserve it. The reservation can’t be changed after you reserve and pay for it. The date and the time are yours and can’t be changed.Your marriage license is valid for 90 days from the date it is issued. To get our marriage license, go to Room 168, on the first floor to check-in 10 minutes before your appointment time. If you plan to obtain your license and be married on the same day, it’s recommended that you make the two appointments an hour apart, for example, license at 10:00 am and ceremony at 11:00 am. Obtaining your license usually takes about 15-30 minutes. You can also choose to make your ceremony reservations online, go to Online Civil Ceremony Reservations. Reservations online may only be booked with a Visa or MasterCard. A $5 convenience fee is added. – This option will provide you a private space in one of three locations inside the building: The 4th floor galleries (North or South), or the Mayor’s Balcony. 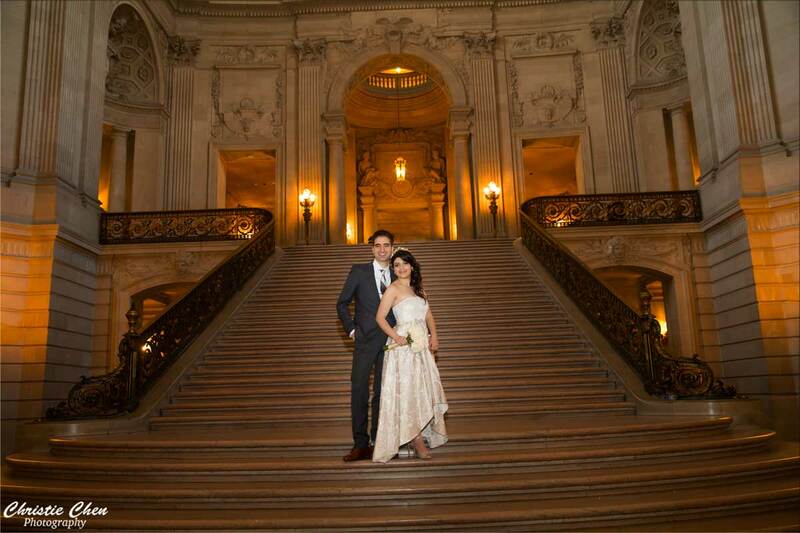 For this option, you will have three advantages: 1), you will have the private space for one whole hour for your San Francisco City Hall wedding, which means that no other couples, photographers or tourists will be at the spots you have ceremony. 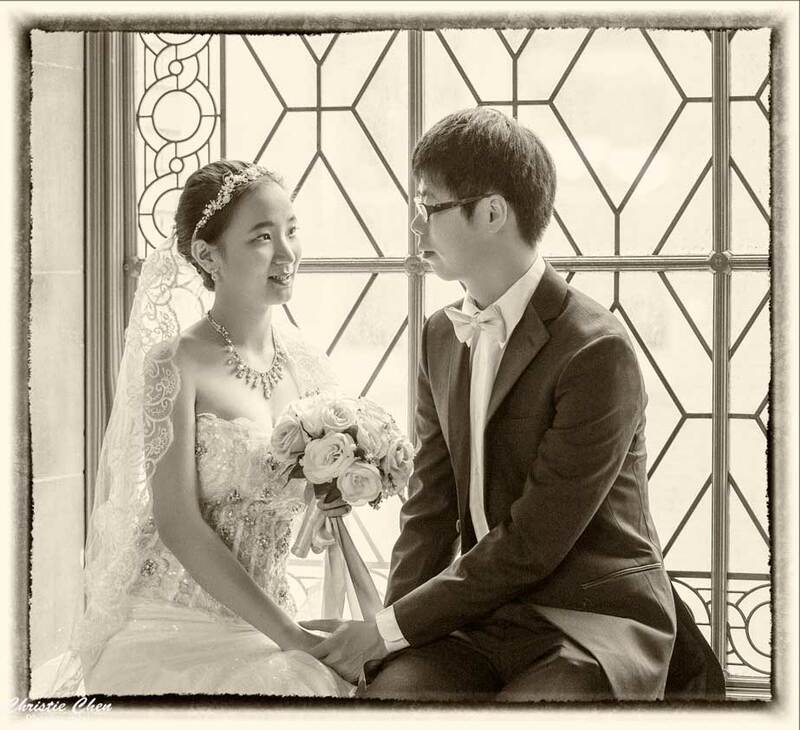 2) you can have much more guests than the 6-guest standard limit imposed on the civil ceremony. 3) chairs and a table will be provided, and all guests can sit comfortably during the ceremony, champagne toast and snacks can be served afterwards. 3) you can also bring your own officiant, and you do not need to use the City Hall commissioner (although you still have the option to do so). Both the Mayor’s Balcony and the Fourth Floor can hold up to 100 guests. 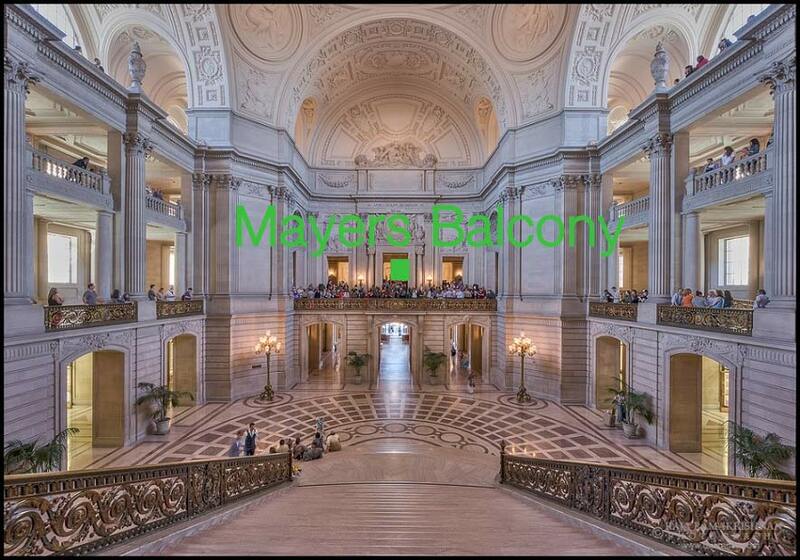 To reserve for the Mayor’s Balcony or the Fourth Floor contact the City Hall Events Department (415) 554-6079 or visit them online. Their office hours are 9:00 am-5:30 pm, Monday through Friday. The additional rental fee is roughly about $1,002. 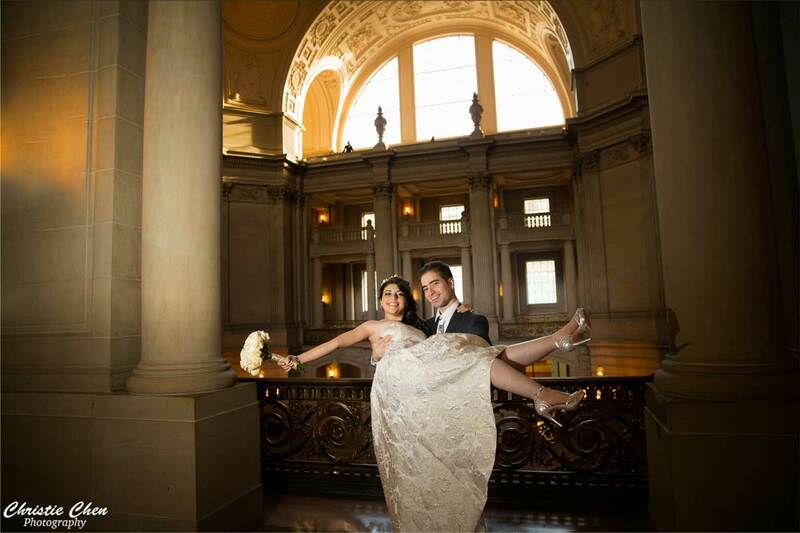 3 Reserve the Entire City Hall on a Weekend – This is an option if you want to make City Hall your wedding venue for the evening. 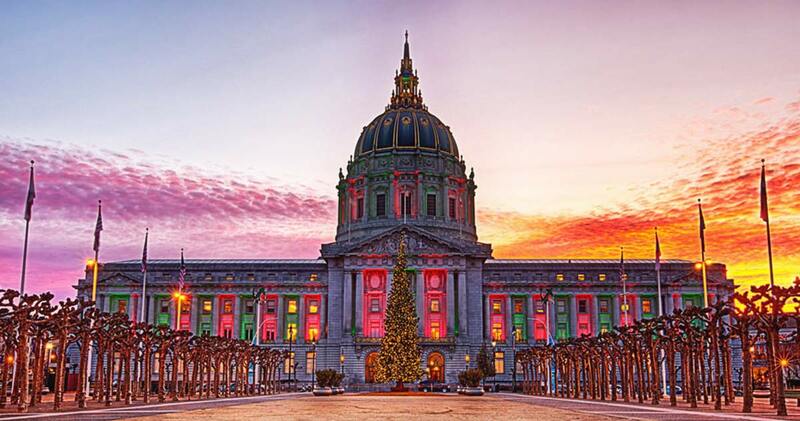 For information on holding events in the evening or on a weekend, please contact theOffice of Special Events, Room 495, at (415) 554-6079 or online at SF city hall event. If you take this option, you may want to make the reservation one year in advance, just as you would with any other wedding venues . Please note: City Hall is a government owned building, many legal requirements are imposed on your wedding vendors – especially proof of liability insurance. You’ll need to bring legal photo identification(passport), cash or check to pay all fees, a valid marriage license, 1 witness, and no more than 6 guests. And remember to bring your rings too! The Legal Stuff: Marriage License. 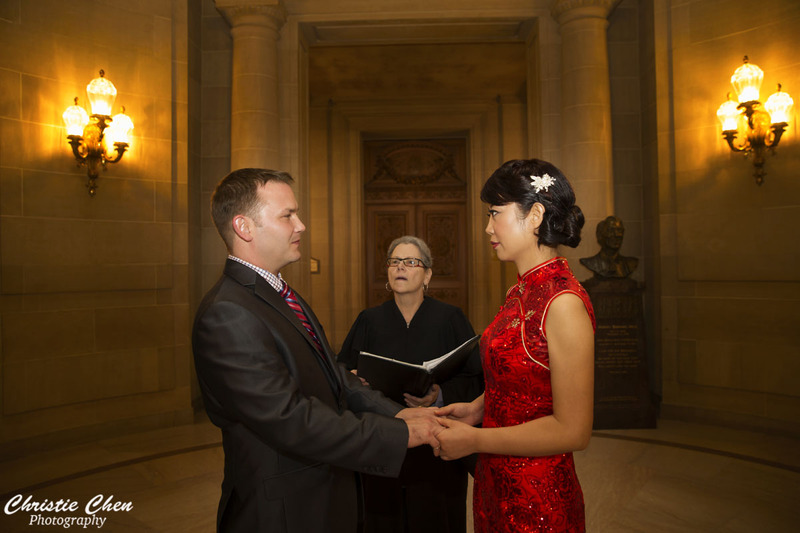 The marriage license may be obtained from any county in California. You are not required to get married in the county where you purchase the public marriage license; however, you must be married in California. You must file the license in the county where it was purchased. You must have at least one witness present at your ceremony. The license contains a place for two witnesses if you prefer. 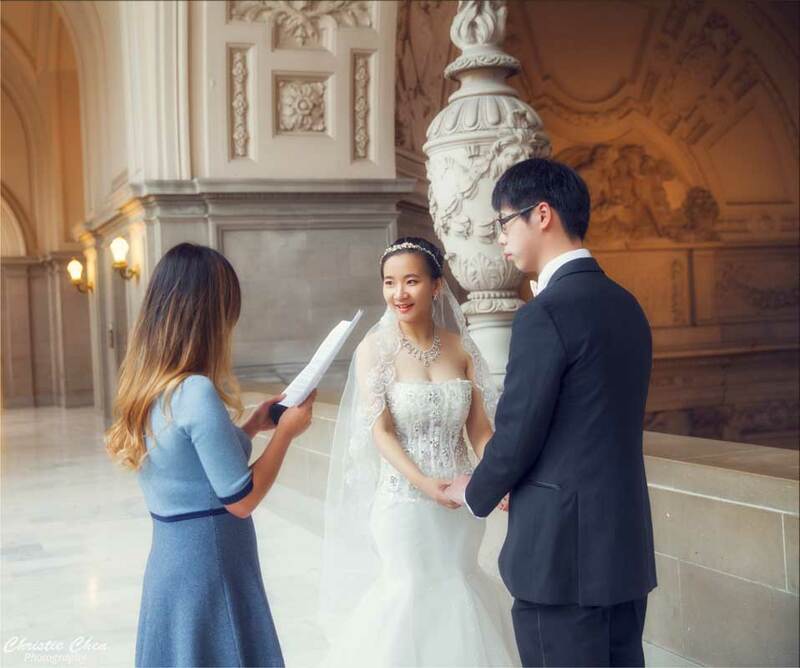 If you are coming to SF city hall for elopement and you don’t have witness, don’t worry, the photographer can be your witness. First Floor – the beautiful pattern on the marble floor, along with the elegant gold lamps makes this a great part of the building to explore. The first floor is also where the County Clerk’s office – Room 168 – is located. The natural light streaming through both the Van Ness and the Polk Street entrance doors also invites some unexpected photographic opportunities. The first floor offers direct access to the grand staircase. One thing to keep in mind is that the first floor is also the busiest part of the building. 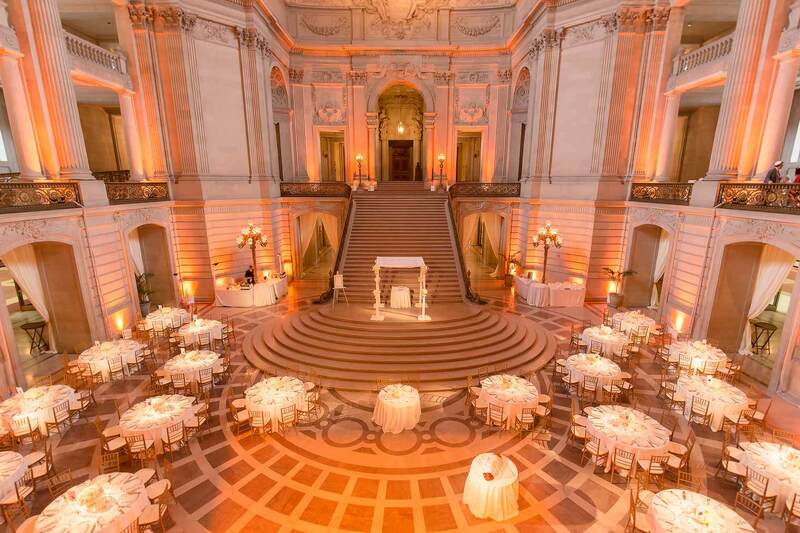 Sometimes the wedding commissioner will offer the ‘private room’ as an option for your San Francisco City Hall wedding ceremony. This is a small room located near the County Clerk’s office, in the administrative hallway. It may be a good option if the building is extremely busy . but keep in mind it is relatively less beautiful than Rotunda. Second Floor – this level of the building is home to The Rotunda, an iconic part of City Hall that plays big role to the majority of San Francisco City Hall wedding civil ceremonies, as well as occasional art exhibits and the annual Christmas tree which will be setup in early December. This level also offers two expansive hallways on both the north and south side of the building, with gilded railings and big windows that make for a lovely photographic setting. Directly opposite to the Rotunda, the second floor is Mayor’s Balcony. You can easily recognize it by its extravagant railing and the giant Roman numeral clock that hangs above. Third Floor – this is probably the quietest part of the building, and for this reason, one of my favorites. This level has giant art deco-style windows on both the north and south side, and you can get lots of fantastic pics by using the decorative window as backdrop. On this level, you are also high enough above the atrium of the building to really get some amazing views. Fourth Floor – this level offers the two popular wedding spots – the North and South Gallery – which can be reserved for your ceremony. The fourth floor is the place which has most abundant nature light which comes streaming into the building through giant windows. It’s also an incredible vantage point from which to fully appreciate the architectural beauty of the building. The architectural details of this level are also stunning. Both Galleries are drenched in white marble, with two intricate, stone urns serving as the centerpieces. Outside the Building – The building is really gorgeous, you can get amazing photographs by using the whole building as backdrop. 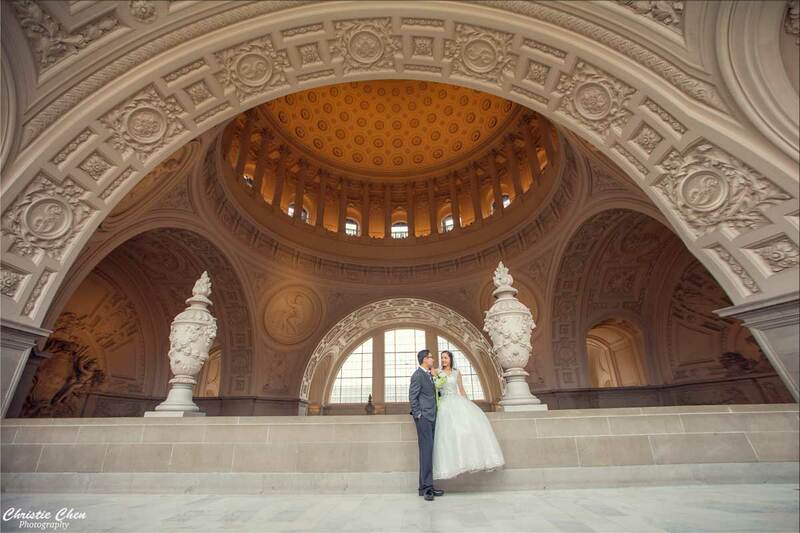 Many couples ask me to recommend “the best time” to get married at City Hall. Best time for the Ceremony is early morning or around noon as City Hall is less crowded that time of the day, waiting is shorter and it is easier to get wide angle photos without tourists in the background. Another thing to keep in mind is Friday is always quite crowded. Tuesday or Wednesday morning are less busy. 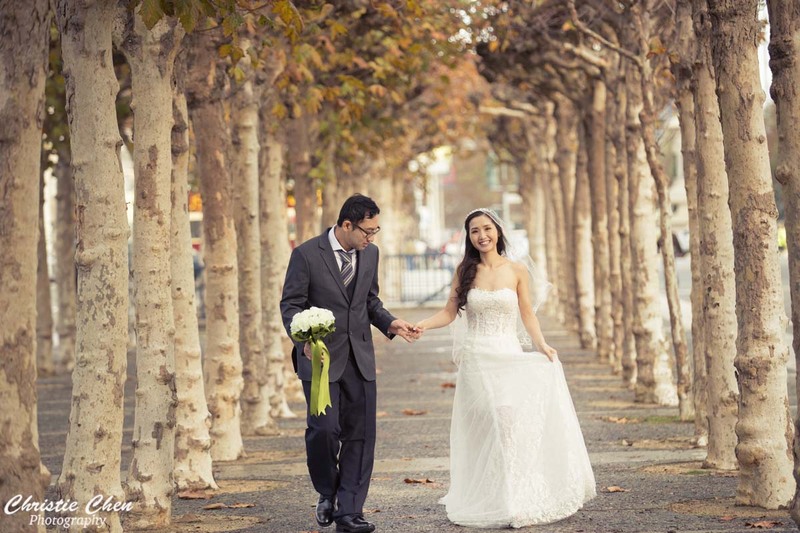 We strongly recommend arriving at City Hall for your ceremony at least 20 minutes in advance. This way, you will be the first in the check-in line for the ceremony. If you are planning a larger number of guests, I’d suggest having your marriage ceremony on the 4th floor. It’s well-lit area and usually very quiet. 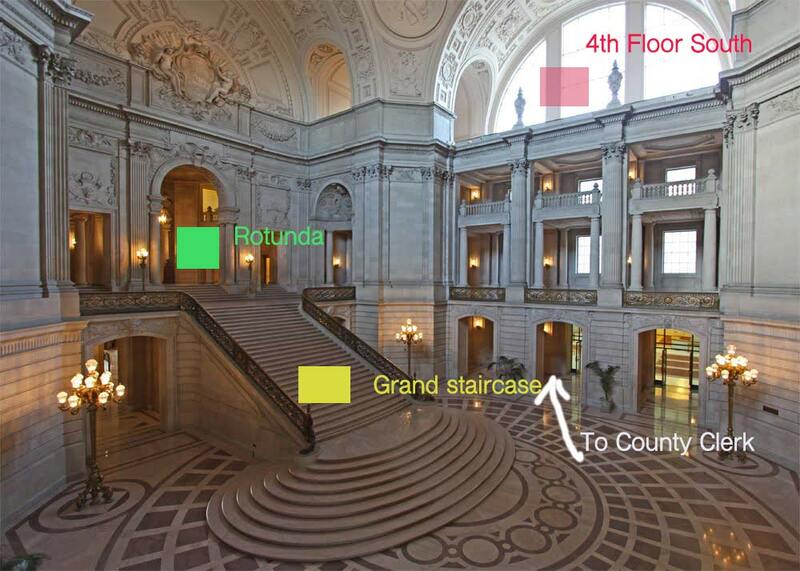 The front entrance of City Hall is at 1 Dr. Carlton B. Goodlett Place, San Francisco, California 94102, between Grove and McAllister. It’s easy to park at meters in the City Hall plaza, which offer up to 4 hours of time. There is also underground parking across the street at Civic Center Plaza, entrance on McAllister St. You can park your car there. Civic Center is the closest BART station, three blocks from City Hall.